Looking over the wonderful selection of films scheduled on TCM in January, if there were only one to watch I heartily recommend 1949s Intruder in the Dust, an adaption by Ben Maddow (The Asphalt Jungle, No Down Payment) of William Faulkner's 1948 novel filmed by director Clarence Brown on location in Oxford, Mississippi. 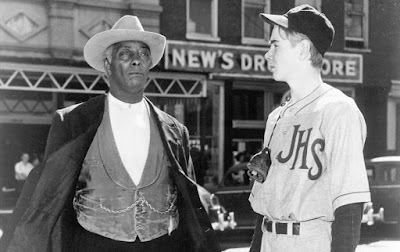 I find in Clarence Brown's best work an empathy for the outsider, particularly as represented by youngsters in such films as Ah, Wilderness, Of Human Hearts, The Human Comedy, National Velvet, The Yearling and Angels in the Outfield. The young star of The Yearling, Claude Jarman Jr., here plays teenager Chick Mallison whose preconceptions about life and people are forever changed by his relationship with Lucas Beauchamp played by the commanding Juano Hernandez (Trial, Young Man With a Horn, Stars in My Crown). Juano Hernandez, Claude Jarmin Jr. When the young Chick tries to pay Lucas for rescuing him from an accident he is rebuffed by the proud individual. It is behavior that is beyond Chick's comprehension of what is the norm between himself, a white boy, and a black man. Lucas continually confounds Chick's ideas, as he does most people. Lucas is not a communicative and friendly man to anyone. He lives life on his own terms. Lucas is also the prime suspect and is arrested when a racist bully played by David Clarke (The Set-Up, The Narrow Margin) is murdered. The outrage in the town is easily manipulated by the victim's brother played by a brutish Charles Kemper. Porter Hall is featured in a stand-out performance as the father of the murdered man. Chick, fulfilling an obligation he knows he owes Lucas, convinces his lawyer uncle played by David Brian to defend the accused. 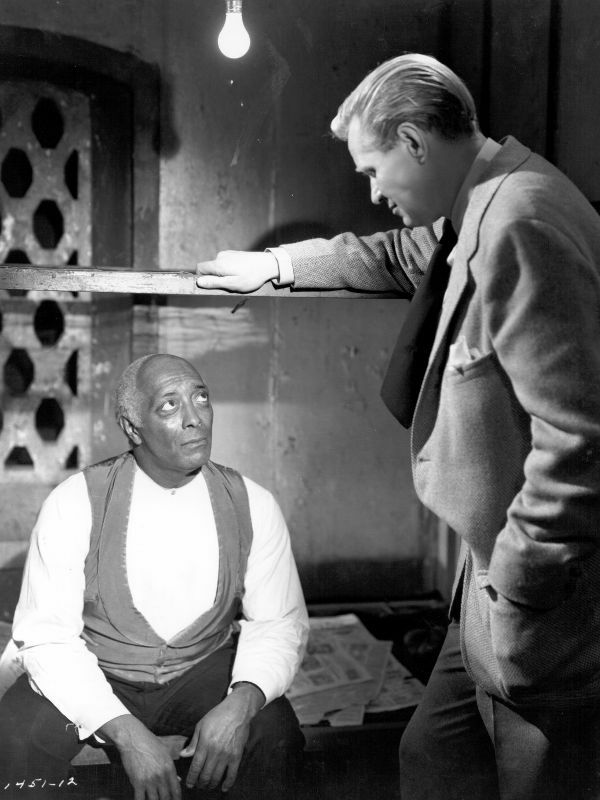 The law, in the form of the reluctant defender and the sheriff played by Will Geer, know that the day will end in a lynching and things are beyond their control. It is Chick with the enlisted help of his friend, the son of his maid, Aleck played by Elzie Emanual who takes a dangerous nighttime trek to a burial site to find forensic evidence that will clear Lucas. Only one thing will give the boys and the law the time they need by holding back the mob. 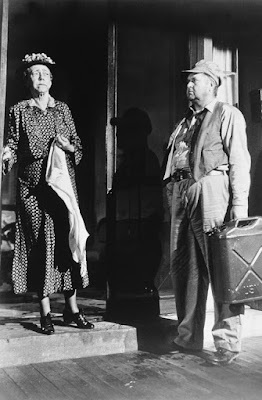 A dozen years before the celebrated scene with Gregory Peck in 1962s To Kill a Mockingbird, we have the frail Elizabeth Patterson as schoolteacher Eunice Habersham setting up her rocking chair and facing down brutal mob mentality. It is a spirited and inspiring role that should have more acclaim. Intruder in the Dust is an exciting, thought-provoking, unsentimental story that will live with you long past the viewing. TCM has the film scheduled for Monday, January 16 at 2:30 pm. Never seen this, but I will try to watch it this month since you give it high marks. Thanks, Kim. If you do manage to fit it into your schedule, please let me know your impression. I will add this film to my "must see" list.. Dawn, I'll bet your "must see" list is pretty long. "Intruder in the Dust" is a winner that should be more well known, especially considering that it's from a Faulkner novel. Thank you, Caftan Woman - I have marked my calendar. Sounds like a good one! Your picks are always worthwhile. Thank you for the recommendation, CW, I'm recording this one. Thanks for this. Not seen it, but I'll try to catch it this time around. I love your remark about Brown's empathy for the outsider. Thank you, ladies. I believe we could start a cult around this movie. I think we could start a cult around any movie we chose! Dawn, there are the odd times when our movie watching can feel more like a chore than a pleasure. At those times it's best to go for a walk and listen to some music, preferably movie scores. Hee-hee. Never heard of it. Intriguing to say the least. Gonna look for it. Thanks. Brian, one of the intriguing aspects is the location filming at a time when it was fairly new to the big studios. Parts of "The Yearling" had been filmed in Florida so the director Clarence Brown did have some experience. Using local citizens for crowd scenes adds to an almost documentary like feel to the picture. Caftan Woman, I can identify with you and Dawn in that much as I love to learn about classic movies I've never seen before, sometimes overdoing it can make movie-watching feel more like a chore than a pleasure. (This is why I've decided to create new Tales of the Easily Distracted posts bi-weekly instead of weekly. But I'm digressing! :-)) Nevertheless, you've gotten me interested in INTRUDER IN THE DUST, especially with Elizabeth Patterson (best known and loved here at Team Bartilucci as I LOVE LUCY's Mrs. Trumball)! Thanks for the tip! R.D. Finch, the Academy repeatedly astounds me at the quality that they have overlooked over the years. I do hope more people give this movie a chance. "A beautifully directed and photographed film and a very moving one too." You said it all. Dorian, I hope you are able to take the time to check out "Mrs. Trumble" in a role deserving of an Oscar nomination. It won't be a chore. I'll join your cult, CW -- haven't seen it either, but now I HAVE to. I love Faulkner's work, and he is difficult to film. There have been some good ones, though, such as "Tomorrow" with Robert Duvall, and this sounds like another good one. I wrote it on my calendar and plan to make a point of watching it. Nice post! CW, an excellent recommendation for the month! This film and THE SOUND OF FURY are the two most potent films about lynching that I've seen (sorry OXBOW and FURY). Becky, you must let me know what you think of the movie. Rick, you are the only person I know who has seen "The Sound of Fury". It must be gut-wrenching, but is on my long wish list, more so after your recommendation. I'll get in touch after I see it, CW. I hope nothing gets in the way of that! I've never seen this either, C.W. What is wrong with me? Maybe the subject matter scared me a bit. Maybe it sounded like the film would have an ugly ending. I wasn't big on ugly endings when I was a kid. Not big on them today, if you must know the truth. But this is definitely going on my To Be Seen List. Thanks for the great review. Yvette, I know what you mean. There are some films I will not watch because I don't want to have an ugly image in my mind. I'm sure you will find "Intruder in the Dust" a worthy drama. Elizabeth Patterson had a long and interesting career, but I'm sure she'd be pleased to be remembered as "Mrs. Trumble". Hooray for "I Love Lucy". I liked the novel and look forward to the movie. Thanks for doing this wonderful write up on Intruder! I would have honestly skipped over it next week. Hopefully I can come back and comment again once I've seen it. RCOcean, I think you will find that the movie makers did a sterling job of adapting the novel. It's a different experience, but the emotions are clear. Page, I look forward to your review. I hope you don't look back from Tuesday with an "Oh, darn, I missed it." CW, I watched Intruder yesterday on TCM. I can see why you wish that everyone would see it. It's a little gem of a movie. The performances are superb, understated and very real. You described the cast very well, and I agree with everything you said. I also thought the way David Brian played the lawyer was excellent, no cheap sentimentality, no huge enlightenment after the fact -- the director was excellent. Thank you so much for making sure that this movie experience was known to all of your readers. This one has taken its place in my archive of special movies -- I want it for my collection. Becky, I'm so pleased you made the movie part of your day. It is indeed a film to appreciate on many levels. I re-watched yesterday and more than ever impressed with the performances. Sometimes when you hear another actor was first choice it can shape your opinion about what you are seeing. I thought David Brian (in place of Joel McCrea) did a sterling job, right from that wink to Chick at the dinner table throughout. Brian and Jarmen Jr. looked like they could be related. Joel McCrea and Juano Hernandez would work together the next year in "Stars in My Crown". Things work out the way they should. Caftan Woman and friends, although other obligations prevented me from watching all of INTRUDER IN THE DUST from start to finish, I was quite moved and riveted by the parts I did see. Unfortunately, I didn't get to see the end -- GAHH! 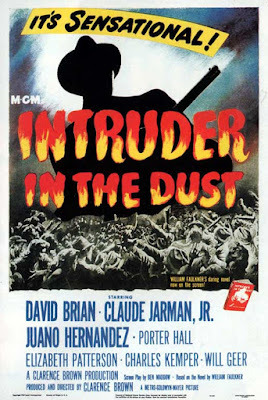 On the brighter side, I noticed on the TCM Web site that INTRUDER IN THE DUST is on DVD for $19.99, so I look forward to getting a second chance! Thanks for recommending the film! Dorian, that's the way to do it - add to your personal library! My favourite thing to shop for is DVDs. I sometimes wonder if I should lay in a supply of cash and jewellery in case a burglar stops by. Unless the criminal is a classic movie fan, there is nothing of value here. You know me too well! I DID miss taping it! Grrr I left your post, the phone ring and I forgot to set the DVR. Next time, Page. Next time.